With August complete, I can officially say I am 100% back to my normal blogging schedule. I didn’t get back to the schedule as early as I wanted though. I had planned to post twice per week starting the first week of August. But, I was so busy playing catch up and still working on everything in my personal life. The last week of August, I managed to get two posts ready live though. Despite being on a limited posting schedule, I did have some pretty awesome success. I increased my social following from 6037 to 6963. That’s 15% which is just huge and a big leap towards my goal of 10,000 followers. 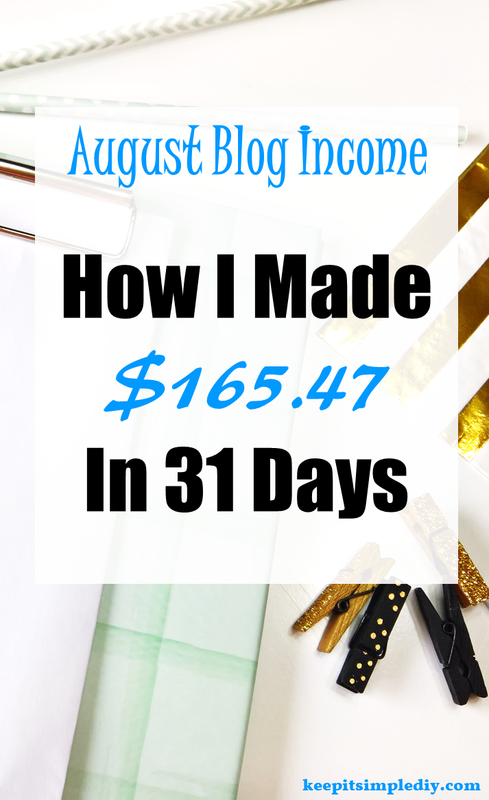 I also had a much better month income wise than the past few. I’m not sure why this month was so much better financially than previous though. I did about the same amount of work with posts. I’ve now been using Board Booster for over a month. I’m not sure if it’s just me, but both Board Booster and Tailwind seem to bring about the same traffic to my site. Neither is much though. Around 300 views per month. So, I’m still searching and reading to learn how to really start growing my Pinterest following. Last month I also talked about wanting to redesign the site. I started working on this and realized it’s really hard to do! After finding a theme, there are so many tweaks that would need to be made just so the site will be functional. So, for now, the theme will stay the same. I’ve just been editing little bits here and there. One thing that happened this month is that I’ve been receiving multiple guest post and sponsored posts requests. I saw my first guest post request the week I decided to take a bit of a break from the blog. Since then, the amount of requests I get just keep going up! Very cool to see a side of the blog that I didn’t expect to see. Next month, I plan to read more into the legalities of blogging. With all of my new requests and the ability to grow, I want to make sure all my ducks are in a row before it’s too late. I can’t believe you made that much in ads. Way to go! I’ve been experimenting with Tailwind and BoardBooster as well and I’m not sure I can see a difference with one over the other. This is great!! Congrats love!! Very good! it’s nicee that you’re doing well with ads. I like tailwind best personally.